December 19, 2017: Triad RF shipped our latest Dual BDA, the L-band TTRM1081D. This unit is compatible with all military and commercial radios and provides over 20 W of linear RF power across 1.3 to 1.4 GHz. Made specifically for multi-in-multi-out (MIMO) radios, providing 2 radio ports and 2 antenna ports, each providing 5 W of 64 QAM power and over 20 W peak power. 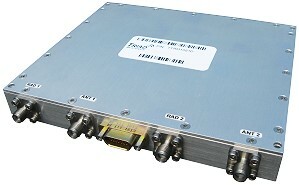 The BDA operates off a single +28 V supply and provides 25 dB of TX gain and 11 dB of RX gain in both channels. This class AB LDMOS module is designed for both military and commercial applications. It is capable of supporting any signal type and modulation format, including but not limited to 3 - 4G telecom, WLAN, OFDM, DVB, and CW/AM/FM. The latest device technologies and design methods are employed to offer high power density, efficiency, and linearity in a small, lightweight package.